Review by AllTheBestFights.com: 2018-09-22, close fight with some nice exchanges: Jonathan Taconing vs Vince Paras gets three stars. Jonathan Taconing entered this fight with a professional boxing record of 27-3-1 (22 KOs=81%) and he is ranked as the No.15 light flyweight in the world. He lost to Ganigan Lopez in 2016 (Ganigan Lopez vs Jonathan Taconing) but then he has won five bouts beating Robert Onggocan in 2018. His opponent, Vince Paras, has an official record of 13-1-0 (11 KOs=85%) and he entered as the No.36 in the same weight class but he comes off his first loss, suffered against Hiroto Kyoguchi in May; before this fight, in 2017, he had won over Michael Camelion, Jimboy Haya, Marlou Sandoval and Aldren Moreno. 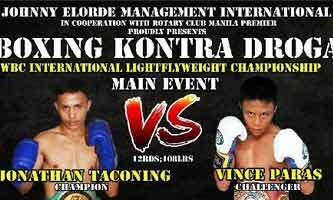 Taconing vs Paras is valid for the WBC International light flyweight title. Watch the video and rate this fight!